Our vision is to forge ahead with courage and innovation, to be an exemplary organization. We will synergize ourselves for continued, enhanced performance. We will foster a culture of care for our stakeholders, and channel our efforts with integrity to build their trust. Our mission is to deliver projects from concept, to commissioning, to lifetime care, using state-of-the-art grid-friendly wind power plants that generate clean and cost-effective energy for our customers. We will be a motivated and responsive partner, committed to quality and timely performance. 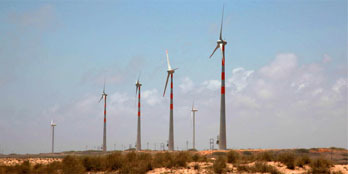 We will actively promote and propagate the use of wind energy, as an environment friendly resource. We shall relentlessly pursue growth, by constantly challenging ourselves. We will work towards being the most trusted wind energy company.